Wikimedia Commons has media related to Amanda Françozo . 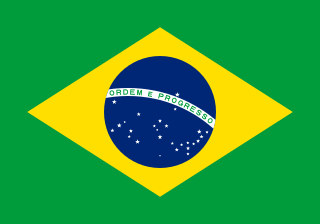 Brazil, officially the Federative Republic of Brazil, is the largest country in both South America and Latin America. At 8.5 million square kilometers and with over 208 million people, Brazil is the world's fifth-largest country by area and the fifth most populous. Brazil borders every South American country except Chile and Ecuador. Its capital is Brasília, and its most populated city is São Paulo. The federation is composed of the union of the 26 states, the Federal District, and the 5,570 municipalities. It is the largest country to have Portuguese as an official language and the only one in the Americas; it is also one of the most multicultural and ethnically diverse nations, due to over a century of mass immigration from around the world. A presenter is a person who introduces or hosts television programs. Nowadays, it is common for personalities in other fields to take on this role, but some people have made their name solely within the field of presenting, particularly within children's television series, to become television personalities. Alcione Dias Nazareth is also known as, "Alcione", and "A Marrom" and is one of the most successful female samba singers, or sambistas, in Brazil. She first gained international recognition in the late 1970 and has had nineteen gold records, as well as five platinum and a double platinum records. 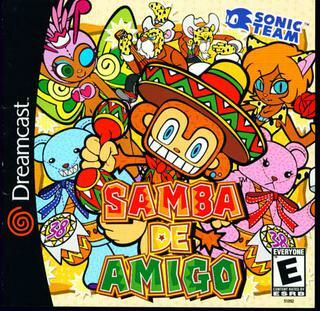 Samba de Amigo is a rhythm game developed by Sonic Team and published by Sega. The game was released in arcades in December 1999, and for the Dreamcast video game console in 2000. A port for the Wii was also developed by Gearbox Software and Escalation Studios and released in 2008. In Samba de Amigo, the player uses controllers shaped like maracas with the goal of matching a series of patterns displayed on-screen. The music in Samba de Amigo is made of primarily popular Latin music songs rather than common or traditional samba. The game also features non-Latin pop songs. Jorge Duilio Lima Menezes, is a Brazilian popular musician, performing under the stage name Jorge Ben Jor since the 1980s, though commonly known by his former stage name Jorge Ben. His characteristic style fuses samba, funk, rock and bossa nova with lyrics that blend humor and satire with often esoteric subject matter. Some of his hits include "Chove Chuva," "Mas Que Nada," "Ive Brussel," "Balança Pena," among others, and have been interpreted by artists such as Caetano Veloso, Sérgio Mendes, Miriam Makeba, and Marisa Monte. Martinho da Vila is a Brazilian singer and composer who is considered to be one of the main representatives of samba and MPB. He is a prolific songwriter, with hundreds of recorded songs across over 40 solo albums. He also has many songs that were recorded by singers from different musical genres. Internationally celebrated artists such as Nana Mouskouri (Greece), Ornella Vanoni (Italy), Katia Guerreiro (Portugal), Rosario Flores (Spain) have put their voices to Martinho’s songs and lyrics. As a singer, he is considered by critics as one of the top exponents of samba to have ever lived. Among his many national collaborations, a few notable names are Zeca Pagodinho, Arlindo Cruz, Chico Buarque, Beth Carvalho, Noel Rosa, Alcione, among others. Furthermore, Martinho composed some of the most important samba enredos and has forged a solid partnership with the Vila Isabel samba school. In spite of being a self-taught singer / songwriter with no academic background, Martinho has a great connection with classical music. He participated in the symphonic project "Samba Classics" under the baton of the late Maestro Silvio Barbato, which went on to be performed by several classical orchestras such as the Belo Horizonte, Brasilia, and Espirito Santo Orchestras, as well as the Orquestra Petrobras and the Orfeônica of Denmark. He also devised, in partnership with Maestro Bruno Leonardo, the Black Concert, a Symphonic performance that focuses on the participation of black musicians in classical music. In addition to being a celebrated singer and songwriter, Martinho is also a writer and author of 13 books: Notable works include Os Lusófonos, republished in Portugal, as well as Joanna and Joanes - A Fluminense Romance, and Ópera Negra, which was later translated into French. At the Book Fair in Paris in 2015, Martinho released his novel Os Lusófonos. As a journalist, Martinho writes articles for O Globo, Folha de São Paulo and O Estadão newspapers, several magazines, and, for two years, he was a weekly columnist of the newspaper O Dia. The Carnival of Brazil is an annual Brazilian festival held between the Friday afternoon before Ash Wednesday and Ash Wednesday at noon, which marks the beginning of Lent, the forty-day period before Easter. During Lent, Roman Catholics and some other Christians traditionally abstained from the consumption of meat and poultry, hence the term "carnival", from carnelevare, "to remove meat." A samba school is a dancing, marching and drumming club or school. They practice and often perform in a huge square-compounds and are devoted to practising and exhibiting samba, an African-Brazilian dance. The schools have a strong community basis and are traditionally associated with a particular neighborhood. They are often seen to affirm the cultural validity of the Afro-Brazilian heritage in contrast to the mainstream education system. and have evolved often in contrast to authoritarian development. The phrase "escola de samba" is popularly held to derive from the schoolyard location of the first group's early rehearsals. In Rio de Janeiro especially, they are mostly associated with particular shanty towns ("favela"). Samba and the samba school can be deeply interwoven with the daily lives of the shanty-town dwellers. Throughout the year the samba schools have various happenings and events, most important of which are rehearsals for the main event which is the yearly carnival parade. Each of the main schools spend many months each year designing the theme, holding a competition for their song, building the floats and rehearsing. It is overseen by a "carnavalesco" or carnival director. From 2005, some fourteen of the top samba schools in Rio have used a specially designed warehouse complex, the size of ten football pitches, called Samba City to build and house the elaborate floats. 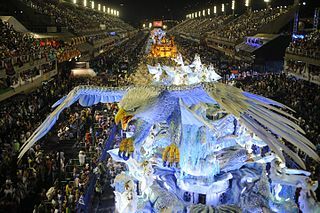 Each school's parade may consist of about 3,000 performers or more, and the preparations, especially producing the many different costumes, provide work for thousands of the poorest in Brazilian society. The resulting competition is a major economic and media event, with tens of thousands in the live audience and screened live to millions across South America. "Aquarela do Brasil", written by Ary Barroso in 1939 and known in the English-speaking world simply as "Brazil", is one of the most famous Brazilian songs. José Bispo Clementino dos Santos was a Brazilian samba singer known as Jamelão. He began in music as a tamborim player, but later became known as the official singer at samba school Mangueira's carnaval parades, performing in every Carnaval from 1949 to 2006. He also toured Europe as a solo performer. Jorge Aragão is a Brazilian musician, singer/songwriter, working in the genres of samba and pagode. He is a multi-instrumentalist, and plays the guitar, surdo, cavaco and banjo, among other instruments. In performance, he usually plays the cavaquinho most of the show, and sometimes the banjo. NGT is a Brazilian television network. The station came about through the acquisition of two educational television concessions by businessman Marco Antônio Bernardes Costa; one in the city of Osasco, in the state of São Paulo, on behalf of the Fundação Fátima, and another in the city of Rio de Janeiro, on behalf of the Fundação Veneza. These concessions became the two headquarters of the network, doing a rotation of generation in the programming between both. The network has 35 affiliated television stations in 15 Brazilian states, as well as several retransmitters in 17 states, covering 13.6% of Brazilian territory. The Grêmio Recreativo Escola de Samba Portela is one of the most traditional samba schools of the city of Rio de Janeiro, and champion of the 2017 Carnival parade. It is the greatest winner of the top-tier Rio parade with 22 titles in total. Rosa Passos is a Brazilian singer and guitarist. The Grêmio Recreativo Escola de Samba União da Ilha do Governador was founded on March 7, 1953 by the friends Maurício Gazelle, and Quincas Orphylo, who were in Cacuia, the main site of the carnival parade of the Ilha do Governador, watching the presentation of small schools of samba and blocks of various districts of the island. It was then decided that the neighborhood of Cacuia should be represented by a samba school. Currently, the school is based in Estrada do Galeão in the neighborhood of Cacuia. Crayon Shin-chan: The Legend Called: Dance! Amigo!, also known as Shin Chan Let's Dance Amigo!, is a 2006 anime film. It is the 14th film based on the popular comedy manga and anime series Crayon Shin-chan. The film was released to theatres on April 15, 2006 in Japan. Isis Nable Valverde is a Brazilian actress who played a lead role in the 2010 telenovela Ti Ti Ti and has participated in several other telenovelas. Grêmio Recreativo Cultural Social Escola de Samba Vai-Vai, popularly known simply as Vai-Vai is a popular samba school from São Paulo, Brazil. At the beginning of the 20th century, there were in the neighborhood Bixiga, at Rua Marques Lion, a football team called Cai-Cai which used the colors black and white, which formed part of a group of crying and played in the field of Lusitana, near the intersection of rock and Una, Saracura River region. around 1928, of friends, led by Livinho and Benedito Sardinha, among them were Henricão, Fredericão, which helped to animate games and parties held by Bandeau, but they were always seen as freeloaders and troublemakers, being dubbed jocular way & quot; class of Vae-Vae & quot;. Driven out of Bandeau, these created the & quot; Block of tattered & quot;, and at the same time, the cord Carnival and Sports which was made official in 1930. Carla Aparecida Perez Soares da Silva is a Brazilian singer, dancer, television presenter and former actress. She reached fame in the mid-1990s after performing with axé group É o Tchan!. Aline Wirley da Silva Christóforo is a Brazilian actress, singer-songwriter. In 2002, she won the talent show Popstars and joined the Brazilian girl group Rouge until 2005, with which she released four studio albums, Rouge (2002), C'est La Vie (2003), Blá Blá Blá (2004) and Mil e Uma Noites (2005), selling in all 6 million copies and becoming the most successful girl group of Brazil and one of the twenty that more sold in the world. Fábio Audi is a Brazilian actor and producer.